Am I excited about granola? Really? Yes, absolutely (insert Birkenstock and Patchouli jokes here). Granola is a dish that, when done right, makes you wish you had it every day. It just needs to be good. And that means granola needs to be from a trusted source, or even better, homemade. Of course, our “trusted source” is Carolyn’s homemade granola. The boys and I are very happy that Carolyn makes this dish regularly. Carolyn’s homemade granola tastes great as breakfast, but also as a snack. We eat it out-of-hand, so the only problem is that the homemade granola does not last long. There are a few extra bonuses to making granola at home: it is easy, much less expensive than store-bought granola, you can adjust the recipe for tastes you like (spices, dried fruit, zest, etc.) and your kitchen will smell delightful when you make it. This is Carolyn’s recipe that she built from a number of sources. The addition of a little olive oil and salt takes this granola to another level. 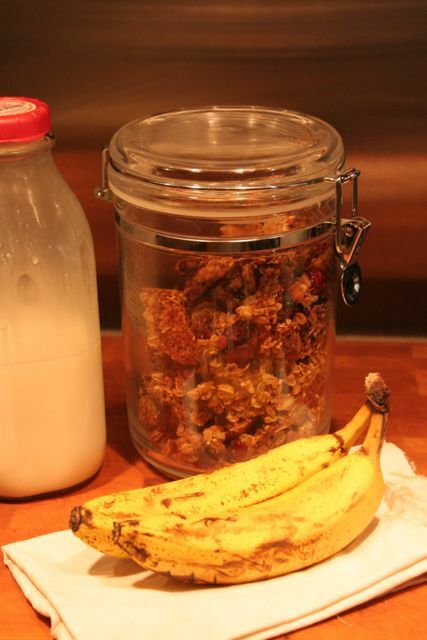 – A great option for the granola is the addition of dried fruit. Carolyn uses dried cherries and blueberries but golden raisins, dried cranberries or other dried fruit will also work. Use what you prefer. – If you want large chunks of granola, press down with metal spatula to compact mixture on the baking sheet before you place it in the oven. – If you want a “loose” granola, stir every 10 minutes during cooking. This also may add a few minutes to cooking time. – The olive oil and salt add a slightly savory flavor that counters the overt sweetness of granola. Your kids will still love this version, but adults may enjoy the added complexity of the dish. 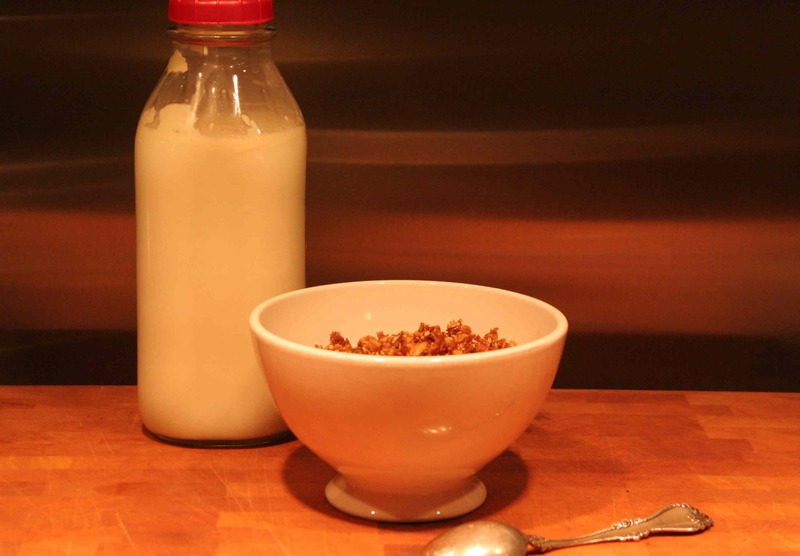 – The granola will keep for up to 2 weeks in an airtight container, if it lasts that long. What you get: Homemade breakfast cereal and snack that will make you wonder why you ever buy this stuff from a store. A kitchen that smells like heaven. What you need: An 18×12 inch, rimmed baking sheet (or 2 smaller rimmed sheet pans). No other special equipment required. How Long? Total time of 2- 2.5 hours. 15-20 minutes to assemble, up to one hour of cooking, 1 hour of cooling. Place all ingredients, except dried fruit, into a large bowl. Stir until completely combined. Spray baking sheet with non-stick cooking spray (or lightly grease with butter). Place granola mixture on baking pan and spread evenly. Cook for 40-45 minutes or until golden brown. Rotate baking sheet halfway through cooking. 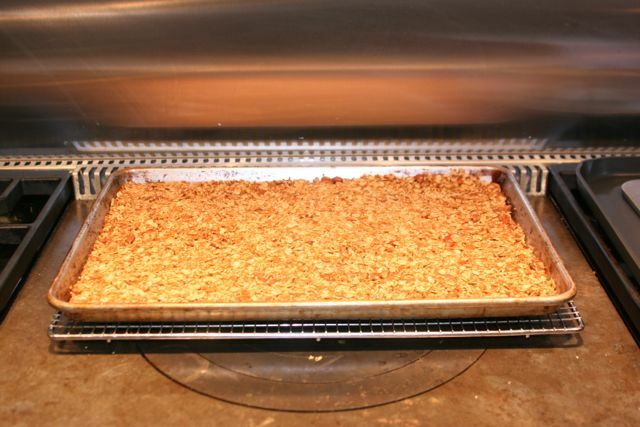 Remove granola from oven and place baking pan on a cooling rack for at least 1 hour. 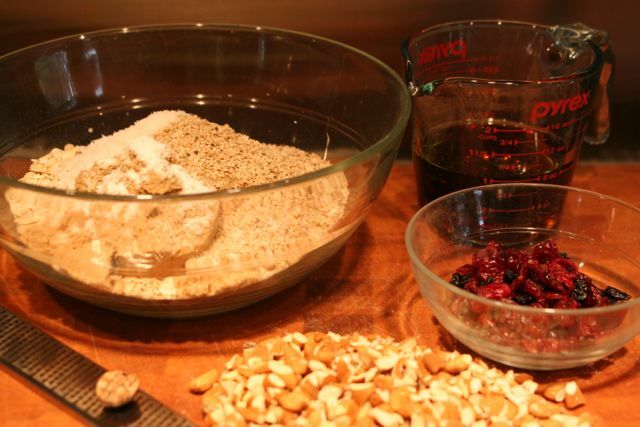 Once granola cools, break up granola into pieces and add dried fruit. Serve or store in airtight container. Im so happy to have your recipe, Carolyn! i shall proceed to make (and eat) a lot!